"When people ask me about Tina Steward, I tell them that when you hire her, you get the whole enchilada. She arrives with her enormous expertise as a veterinarian, chiropractor, FEI dressage rider & clinician, and sport horse breeder. For no extra charge, you also get honesty, compassion, and humor. She’ll never tell you that your horse needs a chiropractic adjustment when it doesn’t. She’ll never criticize you or your horse. What she will do is make your horse feel better and transform both horse and rider during her dressage clinics. Her teaching approach makes magic happen." _ "I have worked with Tina for more than ten years. She was my first dressage teacher, and from her I have learned more than I can describe. Unlike many of her students, I’m not particularly interested in showing, although I have done some. My interest and passion is in the training of the horse that you have---I have neither the money nor the inclination to trade in a horse with challenges for one more gifted to the task. Tina has guided me through this process with unfailing encouragement and insight. My first horse was a Connemara gelding with a huge jump and a beautiful mind, but also a sewing-machine trot, a bad canter, and no suspension. It took a long time, and a lot of frustration, but under Tina’s tutelage, we got a true passage----talk about gait enhancement! Then there is a beautiful, young paint mare that I inherited from my mother. She was stiff, stingy, cranky, and had no idea about the virtues of going forward. I had to learn how to be strict and quick---something quite alien to me. It has been a long and very frustrating journey, but she now has a real body trot and canter, clean changes, and for the most part has learned how to move forward with light aids. (She can still be pretty cranky…) My third horse is a talented Lusitano/Thoroughbred filly with a gorgeous body, but an incredibly immature and explosive mind. My progress with her has been slow, to say the least. Several people have recommended that I give up on her---but not Tina. She has maintained all along that our progress, although “glacial”, to use her term, is okay, and that I just need to persevere, and that she will eventually mature out of these problems. I am happy say that we are now trotting and cantering calmly around the whole arena, and that she is finally beginning to dial in. Tina is an incredible teacher. My experience with her is that she works with where you are, no matter what your skill level or your horse’s talent or breed. Her knowledge of classical dressage is extensive and uncompromising. If your horse isn’t using his back, she gives exercises designed to teach both the student and the horse how to get there. She doesn’t teach tricks----it’s all about starting from the basics, which provide the foundation for everything. It’s amazing to see how under her guidance, horses can turn into beautiful athletes---I have seen this over and over in clinics throughout the years I have worked with her. From working with her, I have learned that you can’t take short cuts, and that it just takes the time that it takes. This was a hard lesson for me, as an impatient and easily frustrated human. I consider Tina to be a mentor, friend, and a master teacher." "To me, Tina Steward is an exceptional trainer and instructor whose philosophy and practical work very much remind me of renowned European Dressage masters such as Egon von Neindorf and George Theodorescu. I have known Tina for many years and trained with her whenever there was a chance, and I have to say that she is one of the truly gifted horsewomen who can help put together the many puzzle pieces that make classical dressage such a daunting yet fulfilling endeavor." _"I have ridden with Tina for about 10 years, progressing from a training level rider to FEI. She is extremely helpful in starting young horses, overcoming their fears and spookiness. She has always insisted that from the very beginning we train towards Grand Prix, insuring the basics are in place. She always asks for the rider to be the leader while at the same time being fair and considerate of the horse. Tina has extensive training with some of the top trainers of her era and brings a wealth of knowledge and exercises to fit every occasion." __ "I have had the privilege of knowing Tina since the spring of 2008. The previous summer I had just moved back to California after working and training in Europe for 5 years. Tina came to the barn I was training at to teach a long time client of hers. I used to listen to Tina teach as I was riding around. Then one day she said soething to her student that I hadn’t heard in a while “lower his neck so he can better access his top line”. While this may sound simple and basic, there are so many trainer’s who are more concerned with a show frame than they are with working the horse through its whole body. After that I began training with Tina myself. Tina has helped me a tremendous amount with both of my FEI horses, Rifallino and Urbanus. They are two very different horses. Rifallino is spooky and hot and needed to be retrained and brought along. Urbanus is younger and is more talented for the Grand Prix but is a weaker horse who needed to develop the strength and stamina to support his extravagant gaits. Under Tina’s monthly training and supervision both horses excelled not only in training but in the show ring as well. Rifallino placed in the 2009 Region 7 Open Prix St. George USDF Championships. Urbanus racked in 70% after 70% at Third level. In the fall of 2009 I took a job in Kentucky riding and training sale horses so that I could compete on the Florida circuit. I still call and talk to Tina all the time about the horses and their training. I send her video on YouTube and thus we are able to maintain a semblance of our training partnership from a far. It is not the same as having her in the ring, but it is far better then not having her at all. Tina’s training is a beautiful marriage of the knowledge of the old masters and the knowledge and understanding of the modern horse and training. She has a wealth of exercises and patterns that help to gymnastisize the horses and help riders gain better feel. She is a very good teacher. She is fair yet demanding of my horses and I. Tina spoke to me about my own seat and riding in a way that helped me become not only more effective but more fluid and elegant. Tina is one of the very best, if not the very best trainer that I have had the honor to work with. She has the unique ability to pull from her experience as an FEI rider, FEI Trainer, Equine Veterinarian and Equine Chiropractor. This vast background gives her a whole horse, whole picture approach that I have not found to such a degree anywhere else. Since moving towards the East coast both Rifallino and Urbanus have continued to improve. Rifallino has now competed in at the Festival of Champions in Gladstone New Jersey two years in a row. He was in the 2010 I-1 Championship and was the Young Rider Grand Prix Champion and Over all Brentina Cup Reserve Champion in 2011. After a very successful year at 4th level Urbanus moved up to Prix St. George and Intermediar in 2011. He had several wins on the Florida Circuit and is now schooling the Grand Prix. I know that much of this success has been based on the solid foundation that Tina was able to give both my horses and me. I look forward to bringing Tina to the East coast for clinics once I have my own program again." "Tina Steward has been an inspiration and a friend to me for the past twenty years. She has been my anchor in the dressage world, always seeing my horses with a kind, trained, and caring eye. Some of the horses I have ridden have been difficult, and Tina was always able to help me do a better job of riding each of them. 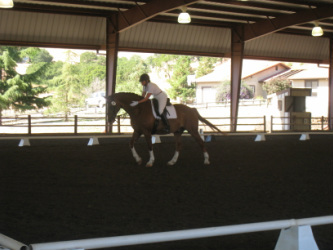 In her quiet, confident manner, she is able to convey her knowledge of horses and dressage in a clear and positive way. After a lesson with Tina, I always feel that my horse and my riding has measurably improved. As our local dressage chapter president, past state Regional Representative and ODS State Secretary, I have arranged several clinics with Tina. The riders all improved and felt positive about the instruction they received. Tina also has done lameness educational events for our chapter and was well received. These events have always been successful and well attended. 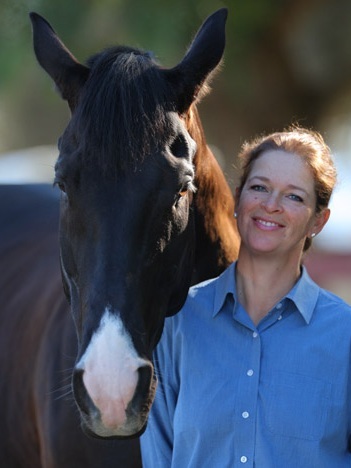 Everyone in the horse world would enjoy and benefit from instruction and coaching from Tina." I have known Tina Steward for over a decade. As a veterinarian looking at close to 20 years in the profession and as a rider going on 40+ years, I feel like I have a "good bead" on the people I've met in the horse world. Tina has been an important inspiration for me, as both a teacher and mentor. Her guidance was instrumental for me in taking an older FEI horse that knew way more than myself, unlocking his secrets, and earning my silver medal. She is now here to support and direct the training on a new young horse, and as always, her brilliant insight and empathy help with every step. As a veterinarian, her holistic knowledge of horse anatomy and physiology are truly impressive. Her body work has always improved my own and my clients horses happiness and soundness. It is a pleasure and an honor to recommend both Tina's chiropractic bodywork and instruction to all that have the desire to learn this difficult art of horsemanship, she has proven to be an irreplaceable piece of the puzzle! I have known Tina for many years. I took my first lesson from her in the 1980's while living in Los Angeles where her mother, Jan, had a horse in the barn. I had a Thoroughbred gelding and was a beginner back then. I was lucky enough to reconnect with Tina when I went to Oregon to look at a horse for sale. I noticed that she was giving clinics at the facility where this horse was stabled. After a couple decades without contact, I called Tina and asked her if she knew this horse. She responded immediately and gave me her insight about him. I purchased him and he has been a wonderful teacher and friend. I have been able to take clinics from Tina and she has helped us tremendously in our journey. I have been able to show him at Prix St. George and was able to earn my USDF Silver Medal. I have learned much from Tina and my faithful mount, Wassini. I am not sure I would have had the confidence or patience to get to PSG without Tina. She has helped me with her knowledge as a Vet, Chiropractor, trainer and friend. She helped me with suppling my horse through his short tense back. This tense back was created by a chronic tooth problem that caused major chiropractic and attitude problems. Tina understands the difficulties in the balance of training, confronting the physical and mental issues of the equine athlete and all the time considering the rider's goals. I believe that her total approach to riding offers a unique overall perspective that benefits the long term program for an equine athlete. Tina tells me to always remember that my horse needs frequent breaks and positive reinforcement to ensure a partnership in the "Dance of Dressage." Above all her knowledge and skill, Tina is a very good friend. She is a very honest person and works hard to promte the best for the horse and rider. USDF Silver Medalist, amateur (for the love of it) rider. I've known Tina since the summer of 1987. I was a newcomer to the barn where she boarded her broodmare, “Poppy” and her Hanoverian gelding, “Mikey.” At first I only noticed where she had been. No matter how early I arrived at the barn, every need of her horses had been addressed. 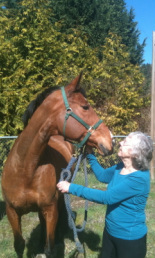 And then she was on to her daily rounds taking care of horses all over the East Bay area of San Francisco. Her constant companion was her little Border Collie, “Marjorie” gallopping alongside Tina or wagging her tail nonstop in the truck. But it was my evening trips to the barn where I really began to notice and appreciate the work that Tina was doing with Mikey. Mikey was the sort of horse that everybody dreams about. He had that old fashioned George Stubbs-type of look. Very overdone in style and utterly flamboyant in his gaits. He would easily have been an international horse had it not been for the fact that he had been pulled on and held and overmanaged all while the spurs dug in to drive him onward. He had become, in short, a neurotic mess. He wore his anxiety like a cloak. In the beginning he would sweat and drop manure when the tack was put on. Through the Summer and into the Winter I would stop to watch her work with this horse and I could see that before me was a person who not only knew the technical side of riding, but also the artistic, compassionate, empathetic, right brained side. The place where “Art” resides. The way that she worked with this magnificent and emotionally tortured horse was a lesson in “joining up,” which I only realized later when I saw the cowboy TV shows on The Horse Channel. And she did it without any twirly roping or little white sticks. Any of that stuff would have sent him into a panic. Many evenings turned to night as I stood hanging over the fence rail watching her work with Mikey. Over time she brought Mikey to Grand Prix. A feat that I believe no one else could have achieved. She built a foundation of love and trust with the horse and added the best of the art of classical horsemanship. By 1988 Tina and her husband decided that they would rent a facility where they could rehab performance horses. This was in response to growing requests from people who wanted them to care for competition horses that needed various types of rehab before they could return to work. Alan Blanke, her husband, is a Veteranarian who specializes in both teeth and feet. They asked me if I would accompany them in this venture and of course for me it was like a dream come true. We did not have treadmills or swimming pools. The farm was almost a hundred acres. When they were ready,we rode the horses in every type of terrain. I lunged some of the horses at a walk on all sorts of varying inclines. We did interval training, strength training, Chiropractic, bodywork, trails, cavaletti and copious amounts of cookies. One particularly famous show jumper won a Grand Prix jump off in Los Angeles three days after we sent him home. He was in absolute peak form. Here I was able to see the remarkable transformation of horses who were given every mode of therapy that would address their primary issues as well as associated ones and the importance of an atmosphere and training philosophy that does not constantly jangle their nerves. This experience ignited in me a life long interest and love of bodywork for humans and animals. During this time Tina also acquired a fairly unique Thoroughbred stallion, “Cloned Steel.” Clone was unique in that he was a Thoroughbred that did not come from racing lines. His ancestors were hunters and jumpers. At that time such Thoroughbreds were becoming a rarity. 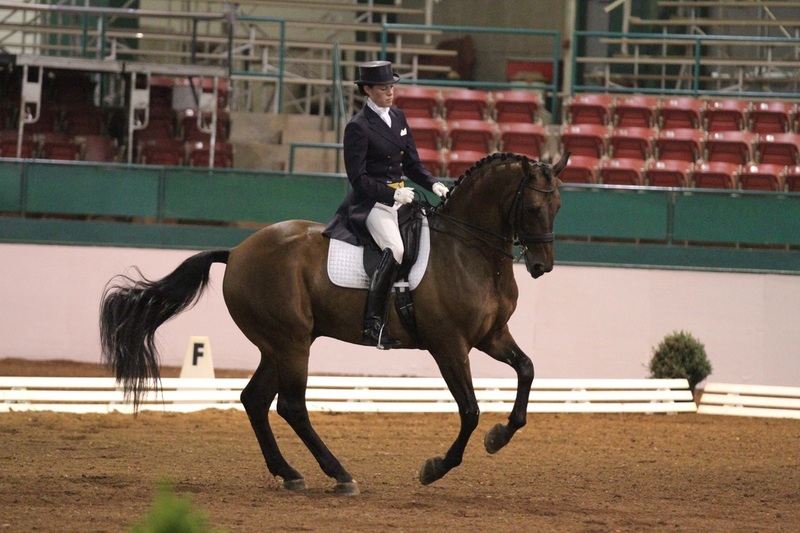 Tina was interested in developing a breeding program that would follow the classical breeding practices that created the talented warmblood lines in Europe. In this approach, you “put the blood on top” meaning that you breed the warmblood or cold blood mare to a Thoroughbred stallion. By using a quality bloodhorse such as Clone on Warmblood mares, she hoped to create an ultimate sport horse with the endurance, lightness and speed of the Thoroughbred without the hot temperament aspect that had turned so many adult amateurs away from the breed. The jumping lines were completely different from the racing lines. Who even knew there were jumping lines for Thoroughbreds. Where the heck were they except for this gorgeous stallion? I don't think that unless one has ever tried to introduce change to a staid body or organization, that it can be appreciated that this is like rolling a 30 ton ball up a hill. One must fight “tradition” and that has a way of becoming cement. Before she could start breeding, Tina had to achieve Warmblood breed organization approvals for her stallion. This meant taking him to the keurings for every major Warmblood organization. I went to a few of these with Tina and it was truly uplifting to see how much appreciation there was on the part of the judging committees for the qualtiy of horse that she was presenting for approval...in spite of how much work and resistance there might have been to allowing him to come for judging in the first place. At the Trakhener keuring, Clone placed first in the jumping even tho he had not jumped competitively in several years. And he outscored younger Trakehner stallions. The late dressage judge and co-founder of the Dutch Warmblood Studbook of North America, Elizabeth Searle, felt so strongly about his quality and the need for this type of quality in the Dutch breeding program that she helped arrange for him to attend the Dutch Keuring. The Dutch brand is the most difficult to achieve and it was his crowning glory. Tina relentlessly pursued the promotion of this beautiful stallion while training him to Grand Prix, showing and training Mikey all while running her veterinary practice and layup facility. Were it not for her passion and dedication to classical dressage, she never would have bothered to take on such a campaign. This characteristic pervades everything that Tina does. Any venture she begins is complete and whole hearted through to the end. In the late 90's I bought a Norwejian Fjord horse. The intent was to have a driving horse as I had become interested in crriage driving. No sooner did I get the Fjord home than my second level dressage horse woke up with multiple twists and died that afternoon at Davis. I came home with nothing but a halter and 14k on my credit card. So I turned to the adorable little 14h Fjord mare to ride as well as to drive. 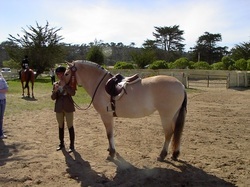 Tina helped me train her in dressage and in 2003 my mare won the first ever “Dressage Pony” award for the highest scoring pony in dressage in California while also quailfying for the CDS annual show. This could easily be filed under Miracles!! but it was nothing less than the great work she did with Wild Thing and me. The picture of her receiving this award was posted in Dressage Letters in 2003 but it was taken on film camera and I cannot find a negative of it at present. However, on the way to qualifying for the high scoring Dressage Pony award, we had to go get an official Pony Card. In order to do that I had to take her to a show where there'd be an official steward who could do the measuring. Pebble Beach is fairly close to me and they were having a hunter jumper show with the requisite steward so I made arrangements to take Wild Thing over there. The show management informed me that I had to also enter a class in order to be on the show grounds. I pointed out to her that we are talking about a Norwejian Fjord horse here, not a Thoroughbred, and not much of a jumping horse either! Rules are rules. So I went out to the PB stables and talked to one of their trainers about finding a kid wouldn't mind being a catch rider and figuring out what kind of class she could go in. We wound up entering her in some kind of hunter on the flat class. There she went into the ring with 11 Thoroughbreds and she wound up placing 8th much to my everlasting dismay as well as to the delight of the girl who ride her and the consternation of the 4 other sets of parents whose kids walked out without a ribbon. Tina Steward knows the heart of a horse. 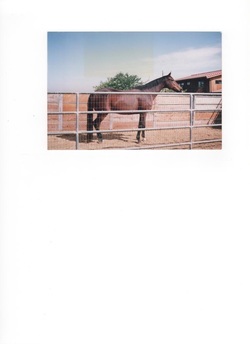 I met her 25 years ago when I bought a Thoroughbred mare that had been left alone in a not-so-good pasture for 2 years. I had known the mare, knew her to be stable and well trained, had a prepurchase exam, which she passed, and I brought her home. She would not eat. She paced the fence. My other mare, a gentle Thoroughbred, was placidly eating in her stall which was right next to Liza, the new mare. After a few hours of this I called my vet, Dr. Bill Nissen, who had done the prepurchase exam but he was not available. His new partner, Dr. Tina Steward, was available and she lived just around the corner. Tina came over and listened to the history and watched Liza pace for a few minutes. Streaker, the other mare, continued to eat in her stall. Tina noticed that there was no way for the horses to see each other when they were in their stalls because the wall between them was solid. "She's afraid the other horse will disappear if she goes in where she can't see Streaker. After being alone for 2 years she is probably a little obsessed with keeping track of her new herd mate. Feed her outside so that she can still see Streaker while she is eating until she is a little more secure. Success! Liza ate outside for 2 years before she finally adjusted to eating in her stall. I don't think any other veterinarian would have suggested this solution. " Aw, she'll come in. Leave her alone ." She probably would have worked herself into a colic. Tina also adjusted Liza -- she was out all over--and my husband had a fine horse to ride for 10 years. I never knew a horse could change shape after chiropractic care! Not only is Tina my go-to person for questions and chiropractic (we live in California and she lives in Oregon so I use my local vet for the usual stuff and UC Davis for big problems) but she is also one of my best friends. She pays as much attention to my current pleasure horses as she would to a top competition Dressage horse. We are always happy to see Tina when she comes down once a month to work in California. I will always remember how lucky I was to call on her for a mare that was reluctant to eat!